In 2014, California voters passed Proposition 47 making simple drug possession a much less serious charge than in previous years. Depending on the type of drug and the amount possessed, these crimes are now only charged as an infraction or a misdemeanor when they could have been a felony in the past. This means that it has never been more important to hire a drug crime attorney who can ensure a charge of possession with intent to distribute or other similar felonies are reduced to a lesser charge. Simple possession charges may be punishable by up to a year in county jail, although this is rarely the outcome for first time offenders. To an experienced California criminal defense attorney drug charges such as simple possession are fairly routine. In most cases, as long as the offender does not have a history of violent crimes or past drug-related arrests, the lawyer can request that their client be placed in a drug diversion program instead of being sentenced to jail time. Known as a Deferred Entry of Judgment, this process requires the defendant to plead guilty to the charge. Once this plea has been entered, the judge then delays sentencing pending the completion of a drug treatment program. These diversion programs typically last about 18 months. At the end of this period, if the defendant has successfully completed the program, the simple drug possession charge is dismissed. When a defendant is charged with possession of a controlled substance with intent to sell, however, the penalties outlined under California Health and Safety Code Section 11351 are much more life-altering. With this conviction, the defendant may be sentenced to up as many as 4 years in a county jail and a fine of up to $20,000. Laws put in place to curb the sale of crack cocaine mean offenders in possession of this drug could spend up to 5 years incarcerated in county jail. Not only are punishments harsher for possession with intent to sell, those who are convicted of this offense are also ineligible for a drug diversion program under California law. For this reason, a conviction most commonly leads to some jail time as well as fines. Being accused of possession with the intent to sell doesn’t automatically equate to jail time, though. Experienced drug crime attorneys are often able to convince the court to reduce the charge based on the history of the defendant and the circumstances of the case. Once the charge is reduced to simple possession, the stipulations of Proposition 47 kick in, and the defendant is eligible for a drug diversion program. In addition to lightening or eliminating jail sentences for those who are arrested for some drug crimes today, Proposition 47 is also effectively retroactively. This means that those who have previously been convicted of a felony drug possession charge may be able to have their offense reduced to a misdemeanor with the help of a drug defense attorney. This is the first step in resentencing or having their records expunged. Under California law, many people who are convicted of a simple drug possession can clear their criminal record simply by completing a drug diversion program. 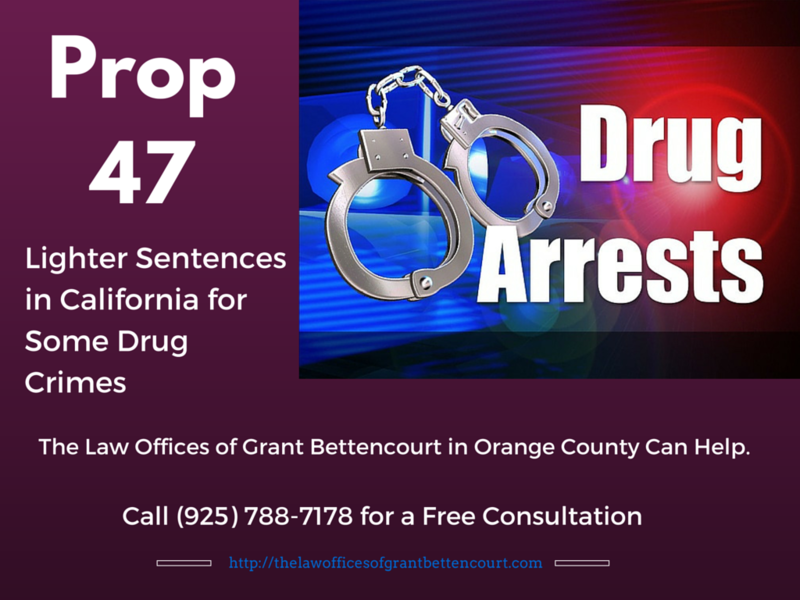 Even if you are facing more serious drug charges, having the right drug crime attorney on your side may be the key in having your charges reduced so that you are eligible for the benefits offered by Proposition 47. To schedule a free consultation about your case, call The Law Offices of Grant Bettencourt today at (925) 788-7178. You may also fill out the Schedule a Consultation form and we will contact you right away.